My last post was about roasting a whole chicken. This here is a quick and easy recipe for making a comforting side dish that can roast right alongside that chicken so that all you have to do to complete the ensemble is toss together a quick salad. This is a “throw it in the oven and forget it” meal that will free up those valuable weekend hours for other things, but still let you sit down to a fantastic family dinner at the end of the day. You can use different varieties of squash in a similar way, but do keep in mind winter squashes can vary widely in density and texture, meaning they can also dramatically range in cooking times. I prefer acorn squash for this recipe (exterior colour of the squash doesn’t matter) but delicata squash, for example, can also work as well, you just have to keep in mind it has a thinner flesh and will likely cook much more quickly. One acorn squash will easily feed two people, so if you’ve got company or a larger family, you might want to do one or two more. 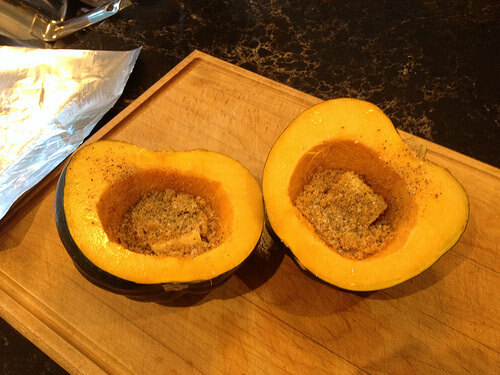 The first step is to halve the squash and scoop out the seeds and stringy bits. Then put about a teaspoon or so of butter in the hollow. Add a generous tablespoon of brown sugar, and season with salt and pepper. 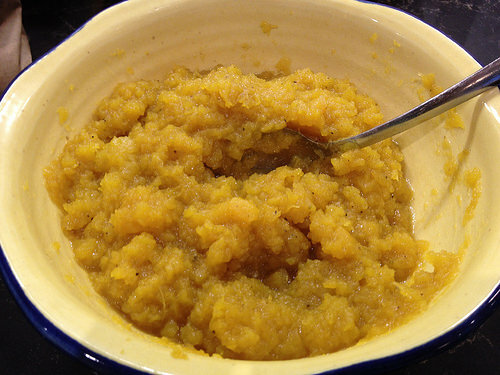 I’ve used maple syrup in place of the brown sugar as well, although it tends to make the overall dish a little runnier. 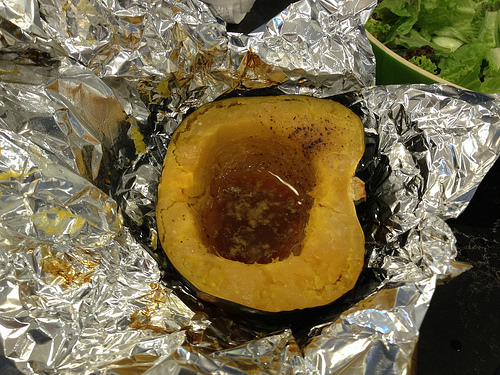 Wrap each section of squash with foil, taking care to ensure all seams are near the upper edge, to avoid leakage, which will then burn and smoke, inside the oven. If you’re roasting these with the chicken you can place them in the oven directly on the racks around the roasting pan when you’ve got about an hour left of time on your chicken. 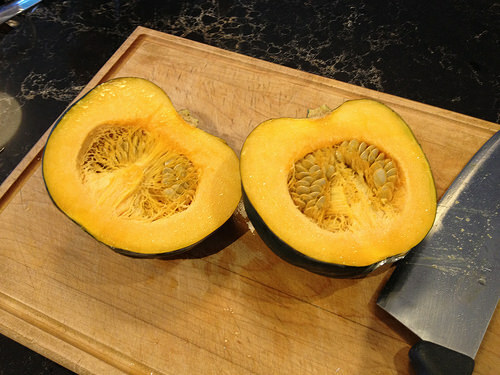 If you’re doing these on their own, set the oven to 350ºF and put the squash sections in the oven directly on the racks. They’ll need about an hour to roast, more or less. You can usually feel them (through an oven mitt) and if they feel soft or spongy through the foil, they’re done. If you aren’t sure you can use a cake tester through the top of the foil to see if they feel soft or still hard, although keep in mind testing them this way can cause your melted filling to leak out and make a mess in the oven. Once they’re cooked, carefully remove them from the oven and place them on a work surface to open up the foil, taking care to avoid burning yourself on any escaping steam. Using a large metal spoon scoop out the roasted flesh and juices into a bowl. Mix up the flesh and juice until well combined, season with salt and pepper if necessary and serve!